The redesigned 2013 Ford Escape, known in Europe and Asia as the Kuga, replaces the 12-year-old model of the same name. Ford sold 254,293 Escapes just in the last year, making it one of the best-selling small SUVs ever. So the new model, shown last fall at the Los Angeles auto show, has some big shoes to fill. The 2013 Escape rides on Ford's C platform, on which also sit the three- and five-door Focus and the C-Max. Three engines will be available when the Escape goes on sale in May: the three-year-old 2.5-liter four (168 hp, 170 lb-ft), a new-to-the-United States 1.6-liter EcoBoost four (178 hp, 184 lb-ft) and a 2.0-liter EcoBoost four (240 hp, 270 lb-ft) already used in the Edge and the Explorer and coming soon to the Taurus. All engines are mated to a six-speed automatic. The 3.0-liter V6 has been dropped. The 2.0-liter EcoBoost's 3,500-pound towing capacity equals the old six's. The base model comes only with the 2.5-liter engine. The SE and SEL models can have either the 1.6 or the 2.0 EcoBoost, and the Titanium model is available only with the 2.0 EcoBoost. Sticker prices, including shipping, are $23,295 for the base Escape, $25,895 for the Escape SE, $28,695 for the Escape SEL and $31,195 for the Escape Titanium. When driving the Focus we've used terms such as "well sorted," "good body control," and "fun to drive." Do those apply to the taller Escape? Well, it does drive more like a hot(ish) hatch than an SUV, that much we can say. It handles well. The suspension is taut, body control is fine (for an SUV), and there's an overall feeling of refinement not found in other small SUVs. We drove only the 1.6 EcoBoost and power was good--plenty for most buyers in this class. Perhaps most remarkable was the truck's quiet ride--there was only slight wind noise and road noise. Ford says its research shows that 60 percent of new-car buyers will look at either a midsize car or small SUV. So there's a good chance that you could stumble on the more modern-looking, stylish new Escape in your shopping. If you're in the market for a small SUV, the new Escape is definitely worth a drive. We wouldn't necessarily have said that about the old one. 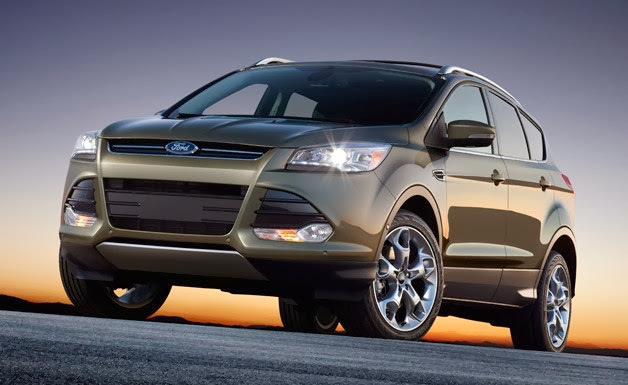 Click here to contact us about the 2013 Ford Escape! 2013 Ford Mustang GT "Gotta Have It Green"